Do you have a little one who needs to ring in the New Year in style and you have been searching endlessly for the perfect outfit? If so, may I suggest My Baby Clothes Boutique which has a fantastic selection of infant, baby and toddler clothing and accessories. I just think this Cozy Rosie Baby Gown is precious and your little princess would be so pretty for her first pictures in this gown. With the weather getting colder and colder this winter every little one needs to keep warm and this Purrfect Kitty Coat is too cute and looks really snuggly and warm too. I really appreciate that My Baby Clothes Boutique has a fantastic selection of high quality clothing on last chance sales too so you can give your kids the best styles while saving money! My three year old son just loves his Denim and Frog Set by Haute Baby that was available on sale for $28.99 from the original $55.99. The quality was superb and he was able to run and play comfortably while still looking very stylish. He is finishing potty training so the elastic waist band was much appreciated for those quick runs to the bathroom. 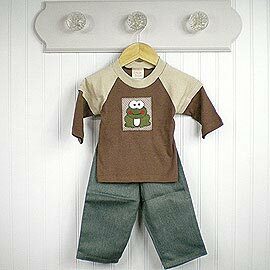 This was a fantastic price for the overall quality of this Haute Baby set at My Baby Clothes Boutique. The Silver Ruffle Dress is a real show stopper and I had to do a double take at the price ($24.99 from $68). It is just gorgeous and I am planning to pick one up for my daughter in a size 4T to save for her birthday! My Baby Clothes Boutique has shoes, diaper covers, socks and leggings, baby hats, personalized clothes, organic clothing, blankets, gifts and so much more. You can view the entire collection here. Wow….hurry over to My Baby Clothes Boutique to take advantage of the My Baby Clothes Boutique New Year’s Sale and save 10% on your order with NO minimum purchase required. Hurry over to read the details because the sale ends soon! I LOVE the Pink Cottontail Coat for my nieces daughter for her first Easter. 1/12 Voted on Picket Fence Blogs. i think you hit the nail on the head w the Cozy Rosie Baby Gown that doesnt even look like a real baby its too cute! i have a 7mo old little girl and she would look OH SO cute in that! Visited My Baby Clothes Boutique. My favourite item is the Tan Waffle Visor Beanie! Subscribed to the My Baby Clothes Boutique newsletter. Follow Simply Stacie on Networked Blogs. Like My Baby Clothes Boutique on Facebook.